It’s good to see at least one of Ontario’s classical theatre companies tackling Bertolt Brecht again. The National Arts Centre in Ottawa engaged most recently with Brecht in its Mother Courage presented in 2010. Other than as librettist for The Threepenny Opera in 2007, Soulpepper has never staged anything by the playwright. Given that Brecht is one of Shaw’s greatest contemporaries and even acknowledged Shaw’s Saint Joan as an influence, it is surprising that the Shaw Festival has staged only three of his works – A Respectable Wedding in 1980, Drums in the Night in 1992 and Happy End in 2003 and 2005 – the latter with Brecht as librettist. By comparison, Stratford would seem a centre of Brechtian theatre having staged the most with six productions – including the opera Mahagonny in 1965, Trumpets and Drums in 1975, Arturo Ui in 1986, Mother Courage in 1987 and the ubiquitous Threepenny Opera in 1972 and 2002. Stratford’s current Mother Courage is the first Brecht since 2002 and the first revival of the play since 1987 when it was directed by John Neville and starred Susan Wright. On the plus side, the present production shows that the Stratford company is ready, eager and able to stage Brecht. On the minus side, Seana McKenna is unconvincing in the title role and Martha Henry’s direction is not incisive enough. Sean McKenna, one of the few bona fide stars of the Festival, has been working her way through the great female roles in world drama and, with Richard III in 2011, even essayed one of the great male roles. 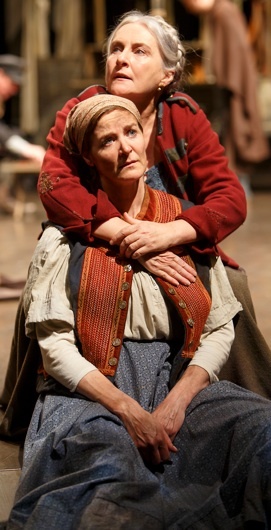 Brecht’s Mother Courage is one of those great roles. Mother Courage is a peasant woman who has risen in life, from her point of view, by running a rolling canteen that caters to soldiers fighting in the Thirty Years War (1618-48) between Protestants and Catholics. When she is in Protestant territory she displays a Protestant flag, when in Catholic territory a Catholic flag. She is proud of her business wiles and the accusation that she is a war profiteer means nothing to her. being a peasant than actually coming across as one. 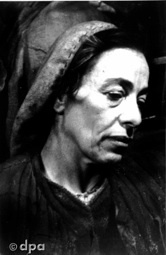 You need only look at a photo of Helene Weigel, Brecht’s second wife, who created the role to see the difference. An actor can, of course, overcome a physical perception through movement and voice. This McKenna does only partially. She adopts a rolling walk, a knees-apart sitting posture and a way of looking askance at others that are new to her. Vocally, she sometimes uses her lower register and tries to maintain a certain brusqueness of speech, but too often she recurs to her habits of phrasing that are more appropriate to Restoration comedy and Noel Coward than to a 17th-century peasant. Her way of expressing doubt by having her voice rise until it almost breaks followed by a rapid descent in tone is much better suited to the drawing room than the battlefield. Director Martha Henry does not help McKenna by making Courage a sympathetic character. Henry understands that the play, written in response to Nazi Germany’s invasion of Poland in 1939, is one of the world’s great anti-war plays. But much as one might wish to admire Courage as a feisty independent businesswoman, she is still a war profiteer. The full title of the play is Mother Courage and Her Children because the play focusses on the irony of Courage as “mother” and how the business she runs affects her “children”. Courage travels throughout northern Europe following the troops with three children each from a different father – Eilif (E.B. Smith), Swiss Cheese (Antoine Yared) and Kattrin (Carmen Grant). She is devoted to her children and in her mind believes that she engages in her business for them. Yet, the play is so structured that Courage loses one child after another to the war that brings her her income without fully perceiving the connection between her business and their deaths. Brecht intended that Courage represent the blindness of capitalism to the misery it causes, but Henry and McKenna try to portray Courage as a pillar of strength and stoicism in the face of the loss of her children. Henry and McKenna lend Courage an inappropriate sense of victimhood without any sense of her own guilt. This is quite the opposite of what the play is about. The best actors who have played the role, like Fiona Shaw in the 2009 revival at the National Theatre, allow the shadow of guilt to play across Courage’s face before they willfully suppress it, often conveying the feeling that if Courage let herself acknowledge any guilt her whole world would collapse. see her play out her dreams and her growing despair that they will ever happen that leads her to commit a final heroic act. Of Kattrin’s brothers Eilif and Swiss Cheese, E.B. Smith is especially effective as a young man whose life provides the irony that war condones the same acts that peace condemns. Geraint Wyn Davies is the one actor who seems to understand the world of the play best of all. He plays the Cook, who takes advantage of every situation that comes his way. The play sets him up in competition with Mother Courage asking us which of the two is the more amoral. The Cook wins, as Wyn Davies demonstrates, through a slickness and charm that hide his utter callousness. Courage seems to think the Cook is the man in her life, but the one who stays with her the longest and is changed by her ways is the Chaplain. Ben Carlson well charts the Chaplain’s story from a cowardly theologian to a man better equipped to face the realities of life, but Henry does not allow the Chaplain’s dependance on Courage to turn to romance as it often does in other productions. Of the many other characters, the two who make the strongest impression are Peter Hutt as an old Colonel and Deidre Gillard-Rowlings as the prostitute Yvette Pottier, who latches onto the Colonel and eventually marries him. Hutt brings out the full humour of the Colonel’s decrepitude and blindness to Yvette’s completely mercenary goals, while Gillard-Rowlings gleefully lies to the Colonel while awaiting a well-to-do-widowhood. When John Neville directed Stratford’s previous production of Mother Courage in 1987, he had designer Sue Lepage begin the play in 17th-century period costume but then gradually update all the characters’ costumes, except for Courage’s, to World War II. The point was obviously to demonstrate the universality of Brecht’s anti-war theme. Henry rather shameless borrows the same idea except that she has designer John Pennoyer carry on the updating to the present so that the soldiers who shoot down Kattrin at the end are in modern soldiers’ outfits with orange road guard vests. Up to this point Pennoyer’s updating has been so subtle that many may not even notice it since all his costumes, except for Yvette’s bright red and later jet black dresses, blend in with his earth-toned palette. The road guard vests, however, call out “Look at me” just so we don’t miss his and Henry’s plan entirely. While the present production may not be perfect, it does show that the Stratford company manifests an undeniable enthusiasm for performing Brecht that the Festival should harness. The late Artistic Director Richard Monette once told me that he hoped to stage Brecht’s Life of Gailieo with William Hut in the title role. Sadly, that never came about. Yet, Stratford should keep that in mind for the future. With Carmen Grant and Geraint Wyn Davies, it already has an ideal Grusha and Azdak for The Caucasian Chalk Circle. Given how many of Shakespeare’s heroines disguise themselves as boys, it would be logical for Stratford to stage The Good Woman of Setzuan, whose title character has to adopt male garb, in tandem with Twelfth Night or As You Like It. Let’s hope Stratford can make us more familiar with one of the most influential of all 20th-century playwrights. Photos: (from top) E.B. Smith, Seana McKenna, Carmen Grant and Antoine Yared, ©2014 David Hou; Helene Weigl as Mutter Courage, ©1948 Deutsche Presse-Agentur; Seana McKenna and Carmen Grant, ©2014 David Hou.